Describe the three phases of the generic view of software engineering. 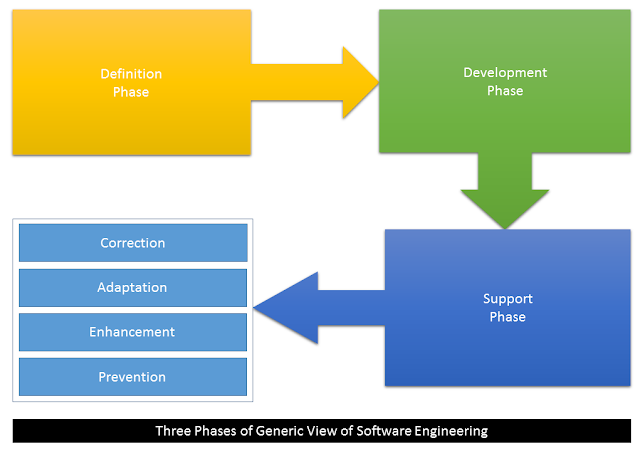 The work associated with software engineering can be categorized into three generic phases, regardless of application area, project size, or complexity. Following flowchart encompasses the phases. The definition phase focuses on “what”. That is, during definition, the software engineer attempts to identify what information is to be processed, what function and performance are desired, what system behavior can be expected, what interfaces are to be established, what design constraints exist, and what validation criteria are required to define a successful system. During this, three major tasks will occur in some form: system or information engineering, software project planning and requirements analysis. The development phase focuses on “how”. That is, during development a software engineer attempts to define how data are to be structured, how function is to be implemented within a software architecture, how interfaces are to be characterized, how the design will be translated into a programming language, and how testing will be performed. During this, three specific technical tasks should always occur; software design, code generation, and software testing. Even with the best quality assurance activities, it is likely that the customer will uncover defects in the software. Corrective maintenance changes the software to correct defects. Over time, the original environment, that is, CPU, operating system, business rules etc for which the software was developed is likely to change. Adaptive maintenance results in modification to the software to accommodate changes to its external environment. As software is used, the customer/user will recognize additional functions that will provide benefit. Perfectible maintenance extends the software beyond its original functional requirements. Computer software deteriorates due to change, and because of this, preventive maintenance, often called software re-engineering, must be conducted to enable the software to serve the needs of its end users. In software engineering, describe the umbrella activities.